WHAT HAPPENS WHEN THE BUCK DOESN’T STOP HERE? OVERLAND PARK, KS (November 13, 2012) – Both parties lose when car and deer collide, and high-speed contact with a doe will cost the car owner a lot of dough. This year, some 1.5 million drivers will hit deer, and the upcoming cold weather months are peak season for deer-vehicle crashes. Drivers can avoid an accident with a buck – and spending lots of bucks on the damage – by following some smart driving tips this fall and winter. Deer crashes result in at least $1.1 billion a year in vehicle damage, according to the Insurance Institute for Highway Safety. On average, the collisions cost $2,800 per insurance claim and up to $10,000 if there is injury to the driver or a passenger, according to the Insurance Information Institute. As migration and mating season hit full swing, the dangers rise, making October through December the most treacherous months on the road where deer are concerned. Early morning and dusk are the worst times for deer accidents, as visibility is limited and deer are frequently on the move. It is important to drive defensively and anticipate the potential for deer in the road. 1. Use extra caution at dawn and dusk and around golf courses, fields and wooded areas. 2. Remember that deer travel in packs – if you spot one, there are likely more behind it. 3. Don't swerve to avoid striking a deer, as that increases the risk of hitting another vehicle or losing control of the car. 4. If there is no opposing traffic, use high beams at night to better illuminate deer. 5. Don't rely on devices such as deer whistles, which are attached to the outside of a car, to try to scare off deer with an ultrasonic or high-frequency sound. They have not been proven to reduce deer-vehicle collisions. 6. 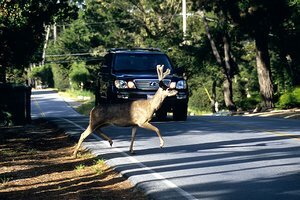 If a deer remains on the highway after you strike it, report the incident to the game commission or a local law enforcement agency, as the deer poses a danger to other motorists. If the deer is still alive, don't go near it because a wild animal with sharp hooves can inflict injuries. If an accident with a deer does occur, it pays to be protected. Many drivers don’t realize that carrying only collision coverage does not cover damage from a deer accident, leaving them with a damaged vehicle and a large repair bill. To fully cover any potential damage, drivers should carry comprehensive insurance that covers such crashes. For those driving an older vehicle who feel their cars aren’t worth the cost of the insurance, it’s smart to keep an “accident fund” if something does occur. If a driver ends up stranded in the woods with a damaged vehicle after a deer collision, they can always call 1-800-CARSTAR. CARSTAR will send the tow truck, call their insurance company and help the car owner get back on the road. CARSTAR Auto Body Repair Experts offers high-quality, reliable repair service in 31 states and 10 Canadian provinces. Just call 1-800-CARSTAR when you need a vehicle repair, and they will send the tow truck, contact your insurance company, arrange for a rental car and repair your car. For more information and store locations, visit www.CARSTAR.com.